It’s been long assumed by this writer and by the daily fantasy NBA community at large that Usage Percentage (USG) is predictive of offensive fantasy points (points and assists). This relationship seems like it should exist, since the more a player tries to create his own shot or shots for his teammates (something USG tries to measure) the more point and assist opportunities that player should get. And, assuming those opportunities are converted, that player should score more offensive fantasy points (OFP). 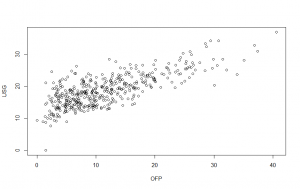 Below I will examine the relationship between offensive fantasy points and USG using R and data from nbastuffer.com, as well stats.nba.com. 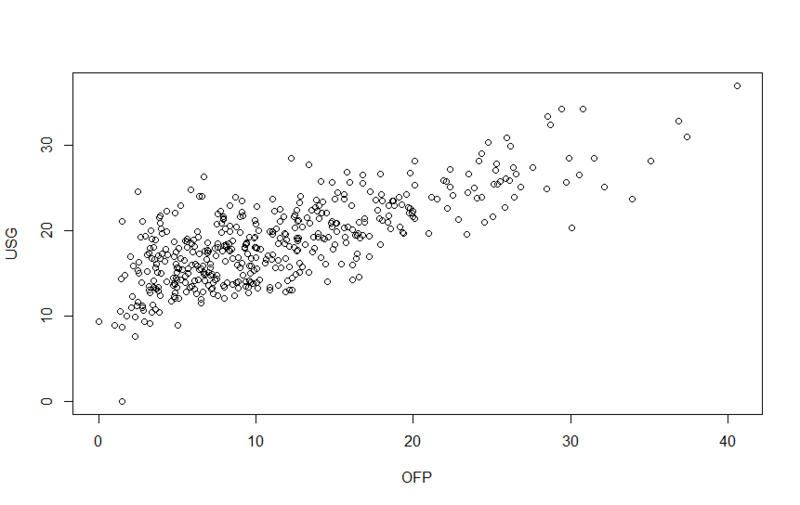 For a first pass, let’s simply see what the correlation between USG and OFP is for players this season and look at a graph of the relationship. The correlation is extremely strong, which is quite evident in the plot. But looking at the relationship of OFP and USG is not the best we can do. 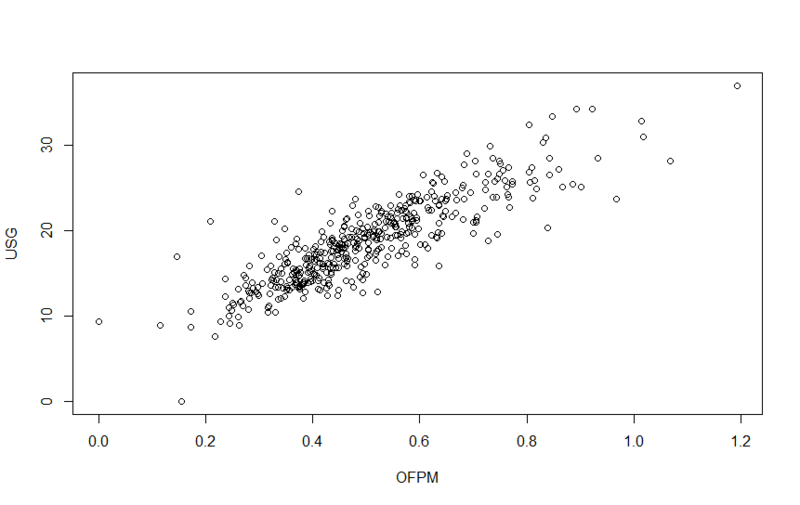 The problem with the OFP dataset is that it doesn’t work well with players who have low minutes. A player who only plays a couple minutes a game is not going to get many more offensive fantasy points if his USG is 30% compared to 10%. Let us instead look at OFP on a per minute basis to get a better sense of USG’s predictive power. We get an even better .867 correlation and the graph looks close to perfect. Keep in mind that the highest correlation any data can have is 1, this relationship is very strong and actually stronger than my original expectation. You’ll notice that any form of assists is generally absent. My guess is that while USG will be predictive of assists, it won’t be nearly as predictive as it will be for points. This turns out to be true. The .39 correlation between USG and assists per minute shows while there is some relationship, it’s not very strong. The graph for AstPM and USG looks quite weak as well. But could this be different based on position? Can we predict assists better with USG if we look at only PGs? This would make sense to me, as PGs who try to create their own shot tend to equally try to create shots for their teammates. On the other hand, forwards and centers may not be skilled passers and will not have a large increase in assist totals as they increase their own shot attempts. We only have a sample of 78, but the relationship actually gets weaker. USG does not seem to be more predictive of assists for point guards. Is there a metric that is more predictive of assists than USG? Probably, but that is something that will require more research and pondering. There’s an obvious application to what the above research has shown: As USG increases, so should offensive fantasy points, and points moreso than assists. 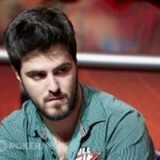 So we should look for expected increases in USG for fantasy value. Our USG trend tool attempts to pinpoint players who have had an increase in USG over the past few games, so always give it a look when trying to find value in your daily fantasy lineups. But this research also gives me a change in perspective on how I view my fantasy point prediction for guards. If you look at our Fantasy Point % tool, you’ll notice that some players score significantly more offensive fantasy points than others. 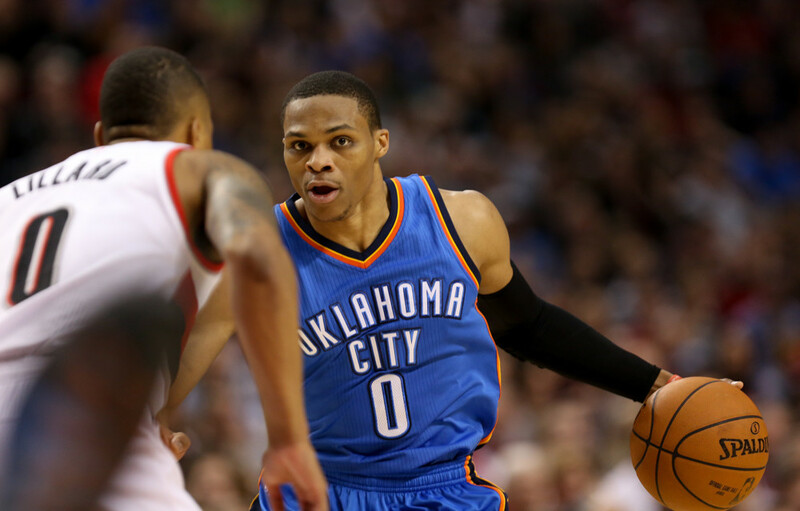 49 out of the top 50 players in offensive fantasy point percentage are guards. So if USG has an extremely strong relationship with offensive fantasy points, and the majority of fantasy points scored by guards are offensive fantasy points, then doesn’t that mean that our expectation for a guards fantasy output should be nearly equivalent to their expected USG? The answer is quite clearly yes. Because of this relationship, it’s clear that a guards expected fantasy output is going to be extremely dependent on the players with him on the floor. This is probably why we have seen such a strong increase in fantasy points from Reggie Jackson and Kentavious Caldwell-Pope with Greg Monroe injured the past several days, and why we saw an explosion from Damian Lillard the past two seasons when Lamarcus Aldridge was hurt. Both Monroe and Aldridge were high USG players who were replaced by low USG players, and the best offensive players on their respective teams picked up most of the slack. The relationship between USG and offensive fantasy points was always clear, but this research has shown the relationship may be stronger than we expected. 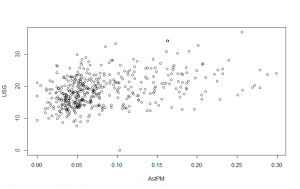 The relationship is much stronger for points than it is for assists, and there may be another metric that is a better predictor of assist expectations. Because of the strong relationship between USG and OFP, we can expect the fantasy production of players who score mostly OFP, guards for the most part, to be highly dependent on the USG of players with him on the floor, which we have seen often over the past two seasons.